My latest trip up Snowdon was something of a flying visit, and has the distinction of being one of the rare ascents of England and Wales’s highest mountain on a day trip from London. A few weekends ago I ascended the Watkin Path on a glorious late-summer Sunday, and enjoyed blue skies throughout the day. This time marked the start of a cold snap, and there was a definite autumnal feel to the weather. The summit of Snowdon is usually in cloud, so if you want views like I did, you need to study the weather forecast carefully and pick your moment. This time the forecast predicted clear skies early in the day, clouding over later in the afternoon. I got up super early for the five hour drive up from London, and was able to start my walk before nine. 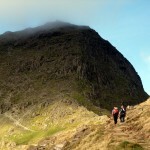 Snowdon offers plenty of different ascent routes, each with their own character. 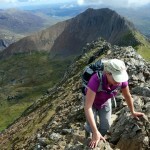 This time I chose the Snowdon Ranger Path over on the west side of the mountain. 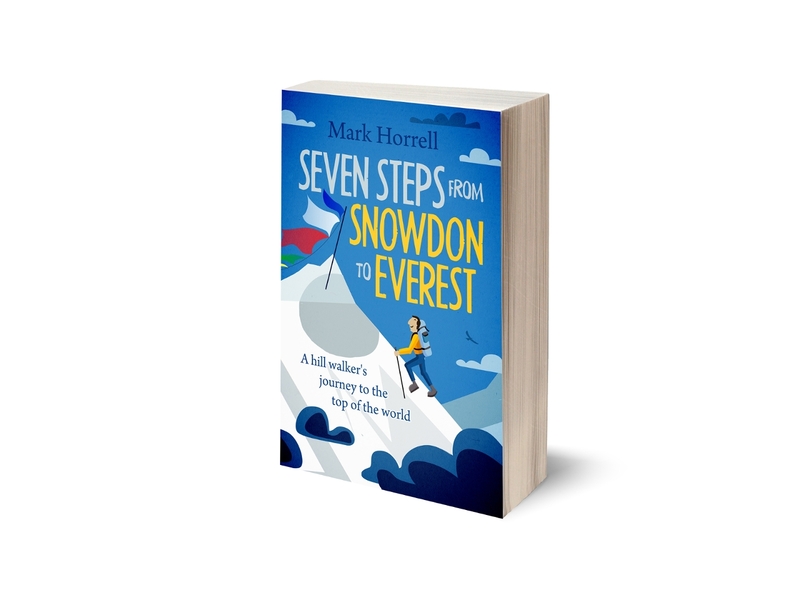 It’s believed by some to be Snowdon’s oldest summit route, though people have been climbing it for so long it’s hard to know for sure. The original Snowdon rangers were custodians of the Royal Forest of which Snowdon was a part. It may come as a surprise to learn this particular forest didn’t contain many trees, a bit like being told that in olden times hill walkers didn’t have any legs, but the original derivation of the word “forest” comes from the Latin forestis silva meaning outside the common law. The royal forests of mediaeval times were areas of unenclosed countryside containing woodland, heaths, hills and even wetland, where the deer could roam freely and the king could hunt. By the time the 19th century travel writer George Borrow arrived in Snowdonia the word “ranger” had just come to mean a guide. 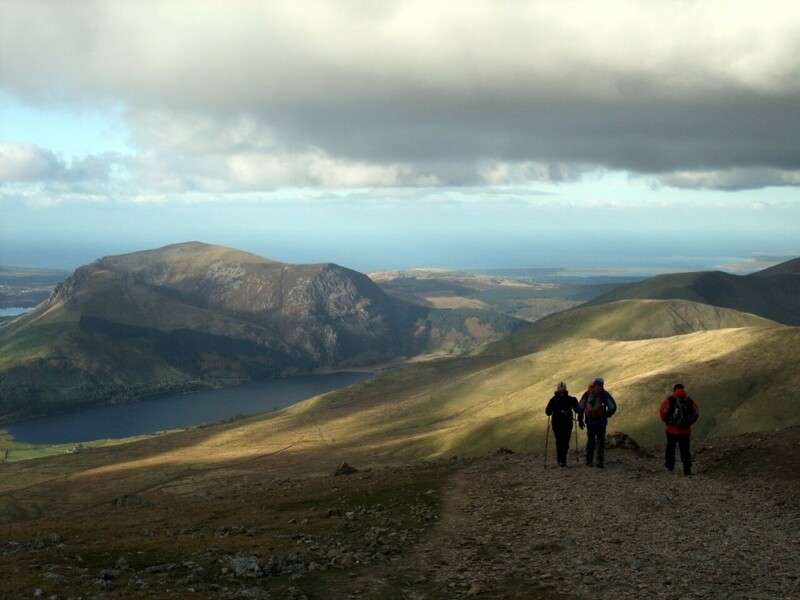 The Snowdon Ranger Path is named after John Morton, a mountain guide who opened the Snowdon Ranger Inn, which is now a youth hostel at the start of the route. Borrow was told by Morton’s son-in-law that, “a ranger means a guide, sir, my father-in-law is generally termed the Snowdon Ranger because he is a tip-top guide and has named the house after himself.” While it’s hard to believe anyone actually used the word “tip-top”, even in 1862 when Borrow published his book Wild Wales, the rest of the story is plausible. A sign at the bottom of the footpath also explains that many of Snowdon’s early visitors were botanists rather than hill walkers, discovering and classifying Snowdonia’s plant species, and some of the early guides went up the mountain to collect medicinal herbs from the cliffs. The only medicine most hill walkers take from Snowdon these days is a well-earned pint in the bar at the summit. 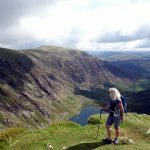 The path from the Snowdon Ranger Hostel starts by crossing the Welsh Highland Railway line and zig-zagging steeply up the hillside above on a very well-maintained trail between tall grass. The view behind, across the Nant y Betws valley, is very pleasant, with the lake of Llyn Cwellyn below and the hog’s back hillside of Mynydd Mawr rising up behind. 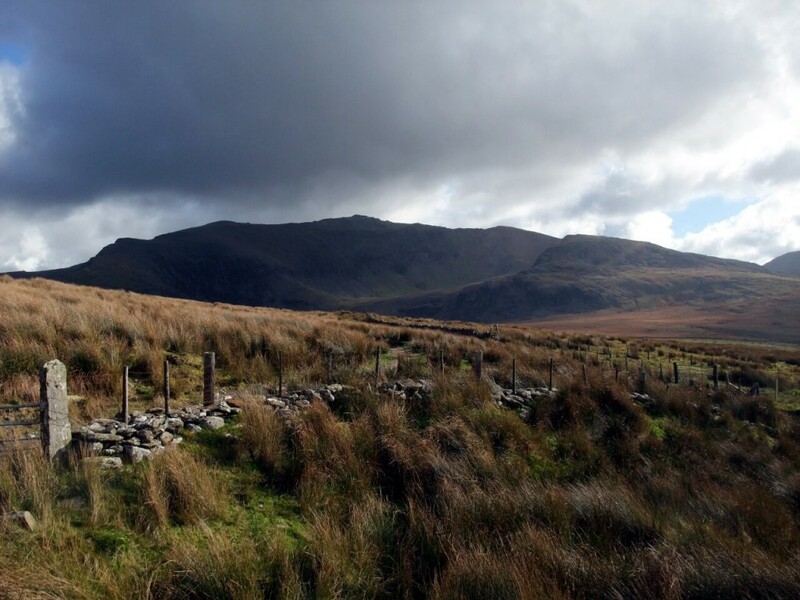 After about 200 metres of steep ascent the path flattens out as it skirts the southern shoulder of Foel Goch. I was now on a wide boggy shelf above the valley, with the west face of Snowdon rising up before me. At this time in the morning the sun was just peeping through clouds behind it, directly into my face and making photography difficult. Snowdon’s west side isn’t its most dramatic, with few of the intricate hollows and narrow ridges which characterise its other routes. From the Snowdon Ranger Path it appears as a long ridge viewed from side on. A single wide and uninteresting cliff face drops down from the summit into Cwm Clogwyn, a broad hollow resting a little higher than the boggy plateau I walked across. The summit was now in view for the rest of the climb, and the next mile of walking was relatively flat as I crossed the plateau. At the far end of it I could see the path ahead of me steepen considerably and slope up to the summit from the left hand side. At this point it actually goes across the top of Clogwyn Du’r Arddu, Snowdon’s best known rock face, known affectionately to rock climbers as Cloggy, but the Snowdon Ranger Path traverses some distance below the ridgeline, so I didn’t get a very good idea of the precipice to my left. I plodded up slowly above a small lake with the unpronounceable name of Llyn Ffynnon-y-gwas, which had now appeared at the far end of the plateau. After about half an hour of steep trail, the angle of ascent lessened, and I had the impression I was gradually rising onto the wide summit plateau. The summit was very obvious from here, with a high summit cairn and the summit building of Hafod Eryri just beneath it. In reality though, there was still another 300 metres of vertical ascent up the gentle lower slopes of the summit plateau. This is where the surreal nature of Snowdon became evident. Until now I had been all alone ascending a quiet hillside with just a few figures visible on the trail behind me, but now I could see the slopes above crawling with people. Most strangely of all I came across a set of tracks just below the summit ridge. Now I know what you’re thinking: what kind of animal comes all the way up here? Either that or you’ve been up Snowdon and you know perfectly well what’s coming up: a really bad pun. I looked up and saw a bright yellow sign saying, “Caution: please take care crossing the railway”. 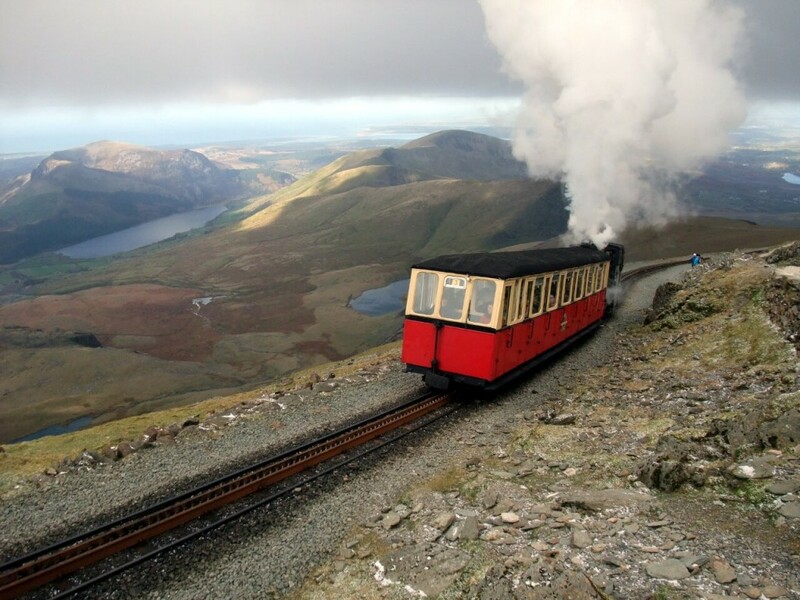 Yes, that’s right, the Snowdon Mountain Railway, completed in 1896, headed down to the town of Llanberis from the summit on an adjacent ridge to my left. I crossed the line just below Snowdon’s summit ridge. Just above this I reached the col of Bwlch Glas, and looked down into the rather more dramatic Cwm Dyli on Snowdon’s east side. 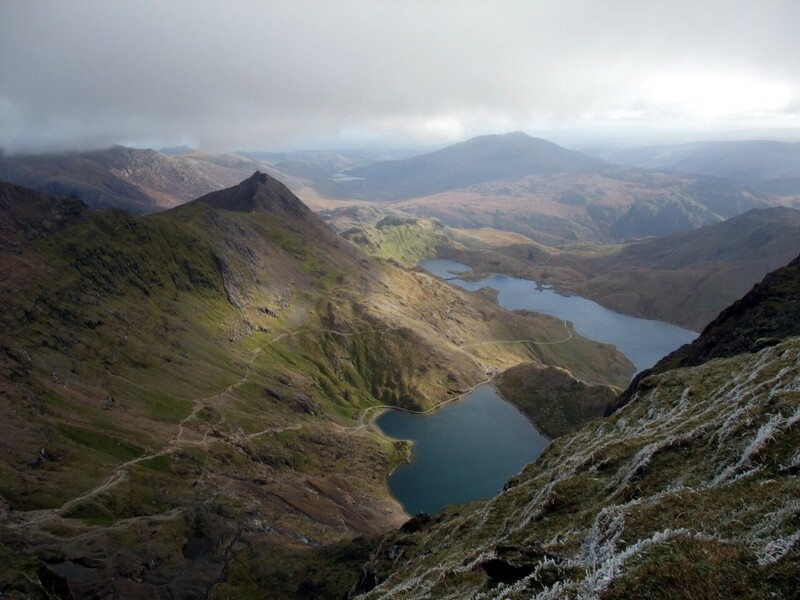 Two lakes, Glaslyn and Llyn Llydaw nestle in a hollow between the two dramatic ridges of Crib Goch and Y Lliwedd. A tall standing stone marks the spot where the Pyg and Miner’s Tracks arrive at the summit ridge after snaking up from Cwm Dyli. There were lots of people up here who had arrived from various routes. Some were wearing jeans and pink trainers, and I felt a little over-dressed in my hefty walking boots. I had another 87 metres of ascent along the summit ridge from Bwlch Glas, up a path alongside the railway line. Before I reached the summit a train tooted past me, and I felt bit like I was on a day trip to Alton Towers rather than a hill walk, but that’s Snowdon for you. 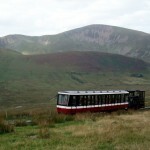 A Snowdon Mountain Railway train approaches Snowdon’s summit. The Snowdon Ranger Path starts at the lake of Llyn Cwellyn in the top left corner of this photo. After tagging the summit cairn shortly after 10.30 and peering down into Cwm Dyli again, I headed for the summit building of Hafod Eryri, where I ate my sandwiches on the step outside. Three weeks earlier I had a pint and a ropey pasty inside, but this time I preferred the quieter fresh air outside. And how fresh! It was decidedly cold on that step, and although I was sheltered from the worst of the wind by the building, my fingers were freezing by the time I had finished eating. I descended by the same route, and the summit plateau had a real wintery feel to it as an icy wind blasted into my face. I needed to descend about 400 metres before my fingers warmed up and I was sheltered from the wind by the slopes to the southern side of Cloggy. Lots of people were now heading up the Snowdon Ranger Path after late morning starts, but for me my day’s walk was nearly over. Back at the Snowdon Ranger Hostel I got another surprise as I crossed the road to the car park. Hundreds and hundreds of runners were passing by, and I realised it was the day of the annual Snowdon Marathon. While I had eaten my sandwiches at the summit and ambled slowly back down, these people had started out from Llanberis and were already more than 15 miles into a 26 mile complete circuit of the mountain. As I sat in the car eating the rest of my sandwiches I wondered whether I would be able to get out of the car park. It was only lunchtime and I still had the rest of the day ahead of me. It was warm and sunny down here and a lovely day for a run (or at least for a walk), and it seemed a shame to waste the good weather, but I knew how bitterly cold it had been up on the hill in that icy autumn wind. I thought about spending the afternoon in a pub, but it was very busy in the villages around Snowdon with the marathon taking place. I didn’t feel like spending the rest of the day in my tent either, so shortly before two o’clock I made the decision to drive back to London. It was a nervous business edging along the A4085 against the flow of runners, particularly when I met traffic coming the other way, but as I free-wheeled down the hill into Beddgelert the last stragglers were walking up it, and beyond the village the road was clear again. It felt strange to be back in London again that evening. You can see my photos of the walk in p.4 of my 2012 album, and you may also be interested in my earlier walk up the Watkin Path. A big day for sure mr mark! IS THIS A RECORD ??????? It’s a fantastic effort, for sure. I would certainly like to be in as good shape as you are if I’m lucky enough to reach your age.